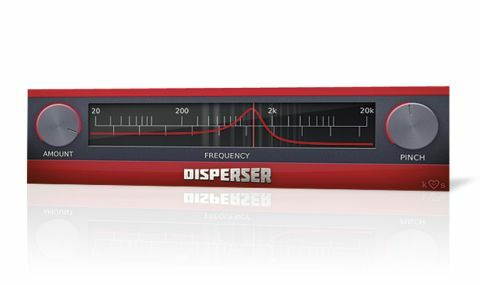 Interesting, effective and cheap, Disperser deserves to become a ubiquitous mixing and sound design tool. Intuitive and nicely automatable. A highly musical take on all-pass filtering. Doesn't create loud signal peaks. Inexpensive. Doesn't do much with softer, transient-free sources. We're all familiar with using filters in our music-making escapades: low-pass, high pass, band-pass and band-reject filters offer huge scope for sculpting and colouring sound. There is another type of filter, though, that is less well known: the all-pass filter, which lies at the heart of Disperser, the new VST and AU plugin from kiloHearts. The centre of the Disperser window is occupied by a horizontal strip with markings representing the frequency spectrum from 20Hz to 20kHz, over the top of which is displayed a curve that represents the filter phase response that results from the current settings. The strip also displays a subtle animation across its length to represent the spectrum of the source and processed signals, whilst a draggable marker on the strip determines the corner frequency of the all-pass filtering. "At low Pinch settings, the sound is reminiscent of a subtle low-shelf filter, but with a softer, gloopier sound"
At the left of the window is the Amount control - as the name suggests, this determines how strong the effect is, and as you increase the Amount dial, the Disperser effect becomes increasingly audible. To the right of the window is the Pinch control that determines how accentuated the corner frequency will be. At low Pinch settings, the sound is reminiscent of a subtle low-shelf filter, but with a softer, gloopier sound. Increasing Pinch causes the frequencies around the corner point to be more pronounced, an effect not dissimilar to that achieved using resonance on a conventional filter. At high settings, Disperser creates a sound that is redolent of a highly resonant filter with an envelope follower, creating a 'zap' sound. But unlike a conventional filter, Disperser does not create massive volume peaks in the process - if anything, because of the way the frequencies in a transient are spread out, extended, smeared and, well, 'dispersed' in time, it can even smooth out the 'peakiness' of a signal, so it sounds bigger yet has more headroom. Whilst it is convenient to discuss Disperser in relation to conventional filters, one thing about all-pass filtering is that the effect becomes much more obvious when there are changes occurring in the sound being fed through it. "Low-end sounds can be thickened, but in such a silky-smooth way it's as if they were coated in Teflon"
Those changes can be (and most often are) transients in the sound (ie, rapid changes in volume level), but frequency changes (eg, playing a legato melody) can also lift the prominence of the Disperser effect. The practical upshot of this is that Disperser is very subtle when fed with pads and other sustained sounds, but when fed a signal containing a lot of transients - drum loops, thumping basslines, staccato synth arpeggios and so on - the results are much more dramatic: Low-end sounds can be thickened, but in such a silky-smooth way it's as if they were coated in Teflon, while extreme settings can pick out details from within the sound without creating intense or saturated volume peaks. What's more, all three controls are fully automatable, and so real-time sound morphing and phase sweeping are genuine and exciting possibilities. Disperser isn't something you're likely to use on all your parts or in all your songs, but it provides a fresh take on filtering and is immensely intuitive to work with. Best of all, it only costs €15, so there's simply no excuse to not have it in your plugin arsenal.